If your fitness routine involves more than walking and running, you’ll likely want an activity tracker that can keep up. But not all devices can compete. Whether you’re looking to upgrade your basic model or you’re ready to dive right into a sophisticated one, we’ve compared two wearables that are suitable for the serious athlete — the Fitbit Flex 2 and the Garmin Vivoactive. What we found: The Vivoactive is about $120 more expensive than the Flex 2. What you’ll learn: The Fitbit Flex 2 is a small yet efficient tracker, while the Garmin Vivoactive is a smartwatch that boasts a touchscreen and more advanced capabilities, such as GPS. 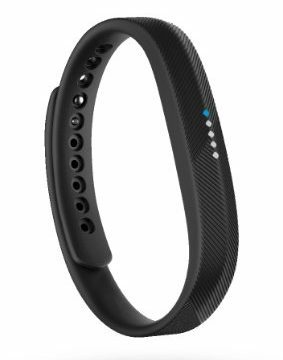 The Fitbit Flex 2 is a thin wristband with a color LED light display. It features a tiny removable tracking device that you can insert into a separately purchased bangle or pendant to wear as a more stylish accessory. It’s a lightweight device, weighing 0.83 ounces. The Garmin Vivoactive is a slightly bulkier smartwatch that weighs 1.34 ounces. It has a sunlight-readable color touchscreen display that measures 1.3 inches by 0.8 inches. It has a wider band than the Flex 2. The Flex 2 comes in black, lavender, magenta and navy colors, and the Vivoactive is available in either black or white. All-day tracking. Both devices can be worn all day long to monitor your steps, distance, calories, active minutes and more. Swim-proof. These wearables are waterproof up to 50 meters and can count your laps and strokes as you swim. Multisport. 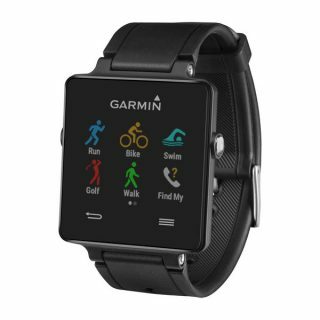 Both devices can track biking and running in addition to swimming. The Flex 2 can also track high-movement sports such as soccer, basketball and tennis, plus aerobic exercises like dancing and kickboxing. The Vivoactive can track golfing. Sleep monitoring. The Flex 2 and Vivoactive track how long you sleep and can wake you up with a vibrating alarm. Alerts. Both trackers feature call and text notifications and will remind you when you’ve been inactive for too long. Designated apps. Download the Fitbit app or Garmin’s Connect app on your smartphone to keep tabs on your progress. GPS. The Vivoactive features GPS tracking, which measures data such as the distance to the green while you’re on the golf course or your speed while biking. Built-in apps. The smartwatch comes with integrated apps for different sports, such as swimming and golfing, that let you view your stats. Through the Connect IQ store you can also customize your watch face and download third-party apps for weather, maps and more. Notifications. In addition to call and text alerts, the Vivoactive will vibrate and display email and calendar alerts, plus notifications from social media, weather and other apps. Controls. The Vivoactive functions as a remote that you can use to select music on your connected device or locate your phone. Both the Flex 2 and the Vivoactive are equipped with rechargeable batteries. The Flex 2 can last up to five days on a full charge. The Vivoactive’s battery life can either be longer or shorter than that — it depends on how you use it. For example, it can survive up to three weeks when it’s used just as a watch and activity tracker. If you use its GPS, however, the battery will last up to 10 hours. The Fitbit Flex 2 has a retail price of $99.95. The Garmin Vivoactive has a much higher sticker price at $219.99. That’s a $120 difference. But you may be able to find the Vivoactive, which has been on the market longer, at a discount on Amazon. Given that you can buy two Flex 2 trackers for the price of one Vivoactive, money may be your deciding factor. The Flex 2 monitors a wide range of sports and activities, including swimming, for less than $100. And despite its versatility, it has an inconspicuous design. But if features are more important to you than the price tag, the Garmin Vivoactive raises the bar. Its GPS lets you track extra stats, and because this smartwatch has a full screen, you don’t need to whip your smartphone out to view them.